Your kids are off to California overnight summer camp at Catalina Island Camps. Their world, and their vocabulary is about to change! Forget about LOL and BRB. Camp lingo is all about real life experiences. 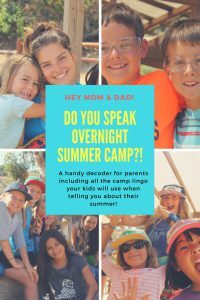 Learn to speak overnight summer camp! 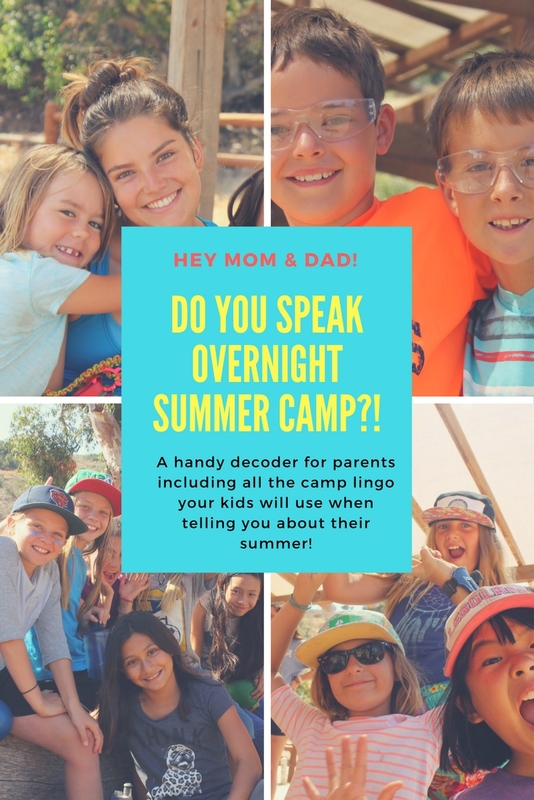 Here’s just a few of the terms you’ll hear your kid talk about after coming home from summer camp at Catalina Island Camps. PBA = power boat activities like water-skiing, wake-boarding, tubing, banana boating etc. Churro = a food served on Burrito night but also an inflatable tube connecting the trampoline and the float that campers try to run across but inevitable slip because it’s round and they’re wet. Sunshine Pavilion (formerly the Airstream Theater) = The stage where campfires, lip syncs and other evening programs are held. Zones = the time after dinner and before evening program where campers can do what they want in a defined area of camp. It’s like recess or free time. Campers have to be where a counselor is located. Activities include Gaga, Nine Square in the Air, basketball, tennis, tether ball, ping pong, crafts, volleyball, sitting on the beach, walking around seeing what everyone else is doing etc. Nine Square = A game played with a very light ball. It’s like four square but with nine squares andplayed with in a PVC frame over your head. Store = the time your cabin is scheduled to go to the camp store for snacks and other stuff. Cabin Time = The 45 minutes to an hour after lunch where campers are out of the sun and in their cabins with one of their counselors. It’s a time to read, play cards, write letters, get mail etc. Heartland = The area of camp between the Outback and the Waterfront. Badgework = A system of tracking camper skill development through camp activities from year to year. A time during the session when campers from different cabins are in activities together instead of with their cabin group. Campers submit their preferences on Friday night of the first week. Tom makes a schedule that is handed out on Tuesday. Badgework starts Wednesday after lunch and runs through Saturday afternoon. Plaques = Counselors make a plaque for their two week cabins and present it on the final morning of the session. It’s filled with camper names, drawings of fun they had and inside jokes. Plaques hang on the wall of the serving area for about three summers as they rotate off. CILTs = Camper in Leadership Training are the 9th and 10th graders who are in the first step of our leadership training program to become a counselor at camp. They have a unique program at camp that includes a 3 day overnight hike of the Trans Catalina Trail, hosting a special event for the rest of camp, and taking a first aid course. They also get presentations on leadership at camp. Special Events = The last Saturday mornings of two week sessions are themed all-camp activities. Campers use their imagination to dress for the theme. Dance Night = The final Saturday night when we have a dance in the dining area. Opening campfire = Tuesday night after arrival is opening campfire when the counselors do skits to introduce themselves. Middle Campfire = During a two week session, on the middle Sunday, the youngest 10 cabins do skits for the rest of camp at the Sunshine Pavilion. Closing Campfire = On the last night of a session, either all the cabins in a one week session or the oldest 10 cabins in a two week session do skits at the Sunshine Pavilion. Target Sports = Archery and Riflery are scheduled together as one activity. Target Sports is also the location of the activity. New to Target Sports in 2017 is Tomahawk throwing! Thursday Morning Adventures = Camper choice activities. Sometimes they are with other kids from their cabin and sometimes they are with other campers. Activities range from PBA, tidepooling, SUP and snorkel trips, Arrow Point Kayak, Emerald Bay hike and beach time, Howlands Peak hike etc. Blackjack = A campground by the airport. What we call one of the four overnights that has a 14 mile hike back to camp. Eagles = One of the overnights and a demanding hike from Little Harbor to camp on the ridgelines. Emerald Bay = The cove next to ours which has a large sandy beach and lots of boats. Little Harbor = A beach and campground on the backside of the island. The Sharks overnight and our Day Trips go here. There is a point of land between Little Harbor and Shark Harbor that looks like a shark, hence the name! Want to know 10 essential items to bring to camp? Click here!